Our Open Air Swimsuit Hot Spring Facility for families and couples. “The Aqua Garden” offers a rich hot spring experience with the fantastic water illuminated musical “Fountain Show” with 3-D images; “Fango Therapy” with natural mineral-rich “Fango” mud from our hot spring; “Salt Sauna” with about 30 different salts from all over the world; and “Float Healing Bath” with illumination and music. The Aqua Garden is a totally new hot spring experience which will, through seeing, listening and feeling, delight your senses. 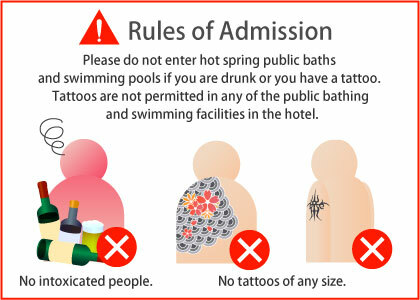 ※Swimsuits are required at The Aqua Garden. 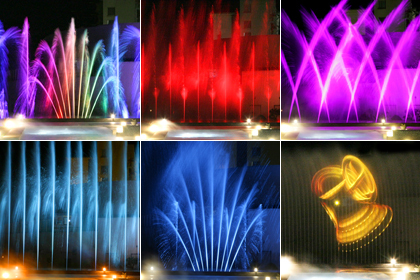 The Fantastic illuminated musical “Fountain Show” excites the audience with its impressive 3-D images projected onto a water screen. The whole experience is almost magical. This fountain show was designed by Mr. Michel Amann, the world-renowned designer for the fountain show in the Palace of Versailles, and is making its first appearance in Kyushu. 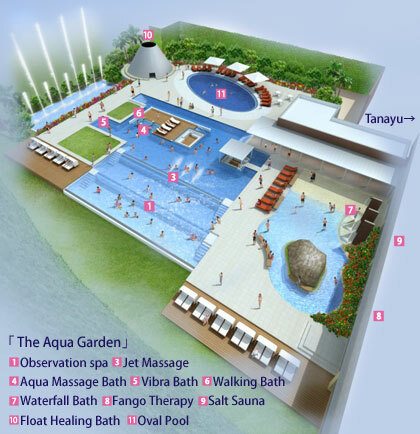 The Aqua Garden is located next to Suginoi’s signature open air hot spring bath, “Tanayu”. One admission ticket allows access to both The Aqua Garden and Tanayu and, as the locker room is shared, you can enjoy both and come and go between the two as you please. 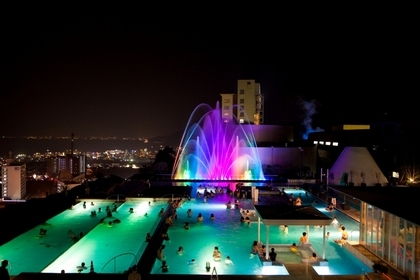 Both The Aqua Garden and Tanayu offer panoramic views of Beppu Bay. ※Swimsuits are not allowed inside TANAYU. Some facilities require a fee for use. ※Swimming rings of 1 meter diameter or less are allowed. ※No other flotation devices or toys are allowed. ※Schedule may change depending on the weather. Fango Therapy has been used in Italy since Roman times. It is said that by covering your skin with hot spring mineral rich mud and then relaxing in a sauna your body temperature will rise, allowing the minerals to be absorbed through your skin, and this helps to soothe away your fatigue. Salt Sauna with the choice of a variety of salts. We have a dry observatory sauna room and a misty sauna room in The Aqua Garden. After entering the sauna, wait until you have begun to sweat a little before applying the salts to your skin and commencing your massage. There are more than 30 kinds of salts from all over the world to choose from other than the regular salts we give you upon entry. Those special salts are from 100 yen to 1000yen. You can choose them to match your skin type, and to meet your needs or purpose. Float Healing Bath- Floating meditation space. With high salt density hot spring water, illuminations and music, the Float Healing Bath is essentially a process of placing the body into a state of total relaxation. You can enjoy relaxing and floating by placing your head on the edge of the bath. There is enough space for more than a dozen people. Floating with illuminations and music leads you to a meditative state.